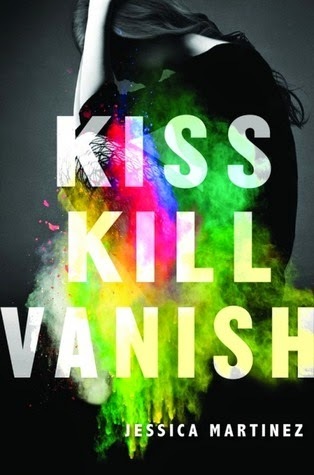 Kiss Kill Vanish is the kind of book that will have you turning the pages quickly because you just need to know the answers. At least, that’s how I felt. The author wastes practically no time with preamble and sets the stage quickly: Valentina Cruz has left her family and Emilio, the man she was in love with, and is hiding from them in Montreal, Canada. Even though we don’t know all the who, what, how and why’s right away— it’s easy to discern that she witnessed something terrible that changed her outlook forever. Then we find out she witnessed a murder committed by her boyfriend at her father’s orders. So it’s no more rich and pampered life in Miami for her. She immediately runs away and has nothing except for a tiny apartment with roommates, Emilio’s old mandolin and a job posing for an artist as his muse. She barely make ends meet but more importantly, she doesn’t know who she is anymore. She understandably questions everything. And we're questioning right along with her. Like Valentina, we don’t know what to believe or who to trust. We learn slowly through repeated flashbacks what exactly she saw and the moments leading up to it. She doesn’t know what it means and even when presented with the “truth”, who’s to say that’s actually the case. That might seem frustrating to some but to me, that's what made the story so addicting. I personally liked the twists and turns and trying to figure everything out until all was revealed in the end. I had a gut feeling early on who Valentina could trust and I liked being right! I definitely liked the story and plot but there wasn’t much character development. I wanted to know more about Valentina, especially her upbringing. Her family plays a huge role in why she fled to begin with and while the author shares Valentina’s memories of them, I wanted something more substantial. I expected them to play a bigger part which would’ve added to Valentina’s internal turmoil but instead they were barely in the book. I may have felt Valentina's fear and confusion over what she was learning about her them but not her conflict. Nor did I understand many of the decisions she made, especially towards the end. I’ve read two books by Jessica Martinez now and I like how different each book is. You really can’t compare them except that the writing will pull you in. I think I would recommend checking out The Vow first but if you’re in the mood for something suspenseful, Kiss Kill Vanish might be for you. If you were going to give yourself a new identity, what would it be and what would you be doing? This is a fun one! So little fact about me, I'm actually part English and my grandmother's maiden name is Grey. Then my best friend and I were just gushing about Isla & the Happily Ever After and how pretty we think that name is. So if I were to rename myself, I would be Isla Grey. I think I would still be a designer but maybe also writing for some pop culture site like Bustle on the side. Or maybe I would just work in an indie bookstore and blog all day. I love your alternate identity! I think we'd still be BFFs, honestly. And we'd probably go on lots of fun adventures all over the place! Also, on Kiss Kill Vanish, I really liked it! I think it's mostly because it's thrilling to try and put all the pieces of the story together. Can't wait to read more of Martinez' books!